This is self-explanatory, and incomplete. Our travels over seven years have become too extensive and overlapping to show on a simple map. We haven't shown our 2012 walk because it begins before the southern border of this map. In 2013 we volunteered from May 1 to 15 as hospitaleros in El Burgo Ranero, two days walk before Leon. We then met our daughter and her husband to accompany them on their first Camino, walking a second time from Astorga to Santiago . . . with a post-walk trip to Finesterre. In 2014 we walked on the Portuguese route, beginning in Porto, walking to Santiago, and then on to Finesterre and Mucia on the coast. In 2015 we began in Moissac in France where we left off in 2008. 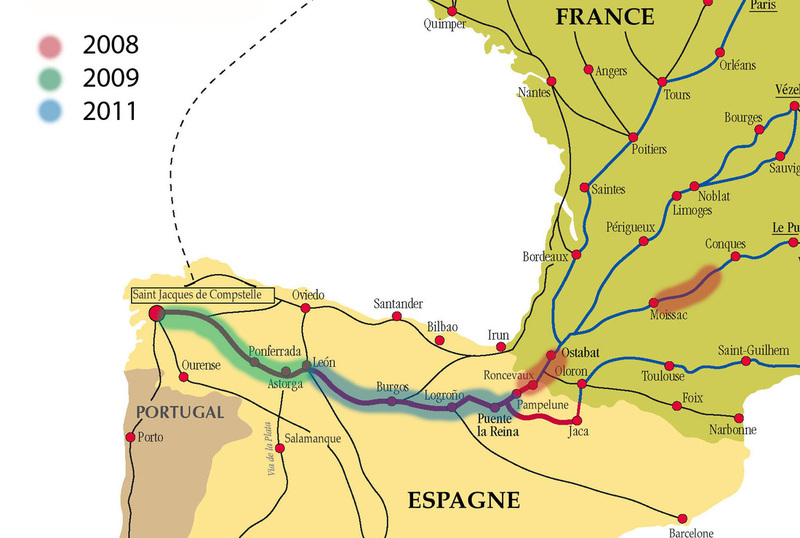 We walked to Pamplona, this time taking the more difficult Napoleon Route over the Pyrenees. Our planning for 2016 is still in the works.